3 When will Penn Jillette formally debate a Bible believing Christian? This page is unbelievable, even by the standards that we have come to expect from "Conservative". I have seen the little video clip from Mr. Jillette, in which he dismissed Conservapedia as a backwater web site, and dismissed "Conservative" as a nothing. The hubris (you can look it up) and arrogance of demanding that a known TV personality must debate you, under some deadline, is staggering. He has no intention of debating or otherwise engaging you. I'm surprised that he even posted a second video. Since you like to demand that people debate you, try this on: I, user SamHB, demand that you debate me on the subject of the Generalized linear model. We won't bother with seconds; just you and me. You have until ... let's see, this is 1 day later than your demand of Mr. Jillette, so ... November 21, 2011. The usual format—written. You will show your erudition (see above) on this subject, and I will quiz you on same. By the way, in the article you never say how the generalized linear model differs from the plain linear model. I know that you fancy yourself an expert on this subject, since you wrote the article, and even demanded that someone read about it while you and he were in some discussion of atheism or whatever. At that time, you seemed, in a number of edits, to be saying that you knew that the Generalized linear model held the key to proving that God exists. Or that theists are more charitable than atheists. Whatever. We have 4 months to refresh our memories on what your claims were. Then you can crunch the numbers for us. You seem to be getting yourself awfully worked up over this issue. Now I know that being mocked by a famous show-business personality is rather degrading, but you brought this on yourself. And you continue to do so. Oh, User:Conservative, I challenge you to debate me on your pet subject of atheism. Just you and me buddy. Mano-a-mano. Show the world that you have the machismo! When will Penn Jillette formally debate a Bible believing Christian? 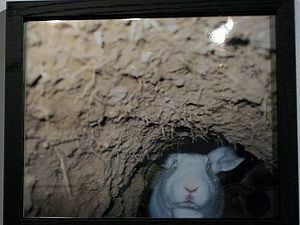 Atheist Penn Jillette in his "intellectual bunny hole" which unfortunately is his native habitat. When will Penn Jillette formally debate a Bible believing Christian? Will the debate actually take place? I'm waiting. User Conservative: I wish to remind you of my challenge (see section above) to a debate on the subject of the Generalized linear model. Now "debates" about mathematics are rather unusual, so I'd like you to think of this as a challenge to each other over our comparative erudition on this subject. Here's how I'd like to proceed: I will post a set of data (not very big; maybe just 20 data points), and you will find a generalized linear relationship that best models the data. I will even make it extra easy: I will give you a few possible (nonlinear) modeling functions, say 4 of them, each with maybe 3 or 4 unknown parameters. You will find the one that best models the data, and show what the parameter values are. Modeling will be in the sense of least squares. This talk page is for my debate challenge to the "atheist chicken" Penn Jillete (or should I say Hen Jillete which I believe is a quip by an atheist at an atheist website which begins with an R and ends in an i) so please be considerate to other Conservapedians and refrain from posting on this page concerning your puerile debate challenge to me.